Former MLB all-star Scott Brosius coached his alma matter, Linfield College, to a D-III title, and now is hitting coach with the Tacoma Rainiers, where his prime student is Mike Zunino. TACOMA – Minor league baseball is exceedingly minor compared to the major leagues. The money, the crowds, the hotels, the meals, the transportation in the minors all pale in comparison to what is available in the big leagues. Excuse Scott Brosius if he’s paid little notice during his first season as a minor league coach. Brosius may be a former World Series Most Valuable Player, all-star third baseman and Gold Glove winner, but he’s also one year removed from pinching pennies as coach at tiny Linfield College in tiny McMinnville, OR. Fifteen years after he abruptly retired as a player to spend more time with his family, Brosius has been welcomed back to the pro ranks as the hitting coach for the Tacoma Rainiers. The Rainiers, members of the Class AAA Pacific Coast League, are the Mariners’ top farm club. Dipoto, daring enough in his first season with Seattle to hire a manager (Scott Servais) with no managing experience, dared to make a Triple-A hitting coach out of a small college head coach after meeting with Brosius over dinner in November in Seattle. Mariners hitting coach Edgar Martinez and director of player development Andy McKay also dined and exchanged thoughts with Brosius. 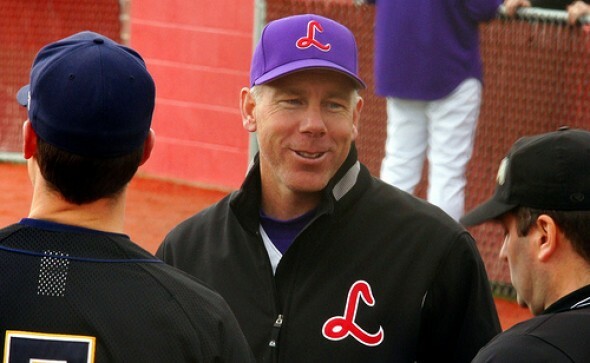 Brosius, who starred at Linfield and Rex Putnam High School in suburban Portland, said he “jumped out of the boat without a life jacket” when he resigned at Linfield last year before lining up another job. Brosius had quietly let it be known in recent years he might be interested in a pro job once his children were out of the house. Brosius spent seven years with the Oakland Athletics and four with the New York Yankees before retiring as a player at 35. He hit a solid .287 with 13 home runs in his final season, when he made $5,25 million. “Would it have been nice to play for one more contract? Absolutely,” Brosius said prior to Thursday night’s game with the Salt Lake Bees at Cheney Stadium. “I know I left a lot of money on the table, but that last contract wouldn’t have changed the way I live my life. Brosius played on three consecutive World Series champions with the Yankees from 1998-2000. He captured World Series MVP honors in 1998 when he hit .471 (8-for-17) with two home runs in a four-game sweep of San Diego. After retiring as a player, the unassuming Brosius settled down in McMinnville, where he had already been spending off-seasons with wife Jennifer (his college sweetheart) and their three children. He immediately began helping out Scott Carnahan, his coach at Linfield, and gradually increased his involvement with the program before taking over as head coach in 2008. Brosius guided Linfield to four NCAA Division III World Series, and the Wildcats won a national championship in 2013. Obviously, the man knows something about winning World Series. Now Brosius wants to help develop future World Series champions for the Mariners. A good start would be the resurrection of Zunino’s career. Once regarded as one of the top prospects in baseball, the 25-year-old Zunino hit just .174 for Seattle last season. “He’s been a pleasure to work with,” Brosius said. “He’s taken this whole thing, this whole year, coming down here to work on his swing, with probably the best attitude a guy can take it with. After a good start, Zunino fell back but is still batting .276 with 12 homers and 36 RBIs in 48 games. Zunino says he’s developed “a more consistent” swing, and Brosius agrees with Zunino that he’s been the victim of plenty of hard-hit outs since the fast start. Whether Zunino is running hot or cold, he says Brosius’ support and approach remain the same. Brosius said he aspires to coach in the major leagues, but he’s not planning to manage at this point. “That might change,” he said. Change, after all, is something Brosius has mastered time and again.